The Vikings played a complete game in all three phases of football and picked up a 31-13 win over the Carolina Panthers. Daniel House discusses where the Vikings performed well in today's contest. The Vikings played their first complete game in all three phases of football against the Carolina Panthers. It led to an exciting 31-13 win, where records were broken, and history was made. The weather was chilly and temps dipped into the negative areas of the thermometer for most of the game. It didn't effect Teddy Bridgewater and he executed his best performance as a rookie. He made all the throws up the field and gained the confidence to complete passes of length down the field. Offensive coordinator Norv Turner did this by allowing Bridgewater to complete short passes to get into a rhythm early in the game. The Vikings offense jumped out to an early lead by scoring on a six-play 45 yard drive to start the game. This was followed by a punt block touchdown by Adam Thielen and just 12 minutes later, Jasper Brinkley deflected another punt and Everson Griffen scooped it up for a touchdown. The Vikings became the first team since the 1975 Detroit Lions to score two touchdowns off of blocked punts in one half. The special teams group made their first huge contributions and it resulted in the Vikings being able to play their first solid game in all three phases of football. They were able to bounce back and pick up a nice confidence boosting win against a struggling Panthers squad. Today was the type of performance Vikings fans were looking for from quarterback Teddy Bridgewater. He finished the day 15-for-21 for 138 yards and a pair of touchdowns. What's more, he accumulated his highest passer rating since a Week 4 win over the Falcons. Bridgewater connected on a 35-yard fade and he avoided any overthrows on balls that were extended down the field. He was calm and collected, while more importantly, making the reads and decisions for the Vikings to be successful. This was easily his best game as a pro and it was good to see him gain the confidence to hit on throws that were 20+ yards down the field. He is starting to look more comfortable and he took advantage of a struggling Panthers defense. Matt Asiata took over the starting duties after Jerick McKinnon missed today's game with a lower back injury. He rushed the ball 14 times for 52 yards and he was averaging almost four yards per carry. The Vikings were able to mix in a healthy dose of the running game to sustain drives and ultimately perform well as an offense. Ben Tate saw his first action with the Vikings and accumulated 15 yards on five carries, including a nine-yard run. The Minnesota running game performed at the level needed for the Vikings to win and that is all you can ask from a group that has been shaken up frequently. Greg Jennings led all receivers, notching five catches for 45 yards and a 17-yard touchdown. He continues to run smooth routes, while gaining separation in the red zone. Bridgewater is becoming more comfortable connecting with the veteran wide receiver and he is finally starting to perform well enough to move the chains. Charles Johnson continued his impressive stretch of games and caught two passes for 41 yards. Teddy Bridgewater loves to find both Johnson and Jennings and they have been adequate weapons for this offense over the last two weeks of play. Cordarrelle Patterson didn't see much action today and had zero catches, while being targeted once on offense. It is unknown what has happened to him this season, but it appears other wide receivers are starting to take away his snaps. Kyle Rudolph got the Vikings on the board by hauling in a 7-yard touchdown on the Vikings first drive of the game. The play action pass had the Panthers defense biting and Rudolph didn't have a defensive back within 10 yards of him. That was his lone production on the day, but he wasn't awarded many opportunities because the Vikings offense wasn't in the position to need a massive amount of scores from their offense. Rudolph was very effective in run blocking and he sparked several long runs, where he pancaked defensive backs in the second level. It was great to see Rudolph involved in the red zone and the hope is that he is starting to evolve in this area of his game. The Vikings offensive line still allowed three sacks, but the amount of total pressures they awarded was improved. Replacement right tackle Mike Harris was beaten for sacks on two occasions, but Matt Kalil appeared to play moderately better today. Joe Berger was blocking very well in the second level and played a pivotal role in sparking a Jarius Wright screen pass late in the first half. As a whole, Teddy Bridgewater had more time to make his throws, but the pocket still isn't quiet clean enough for my liking. However, it was good to see this group make a stride and not fall apart with the loss of right tackle Phil Loadholt. 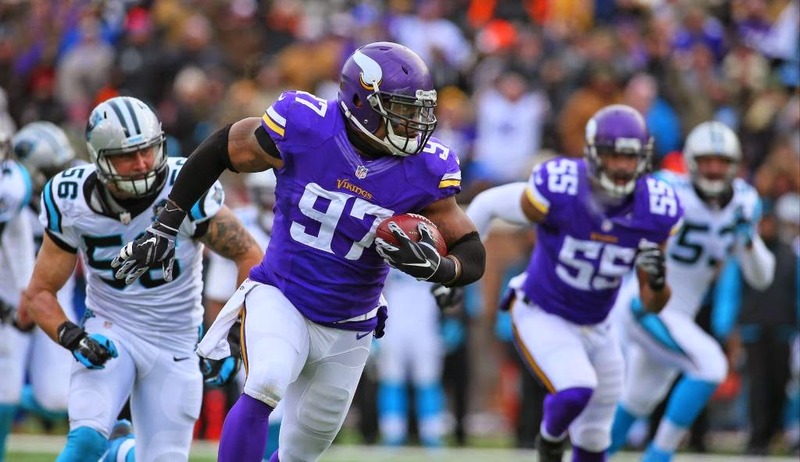 Everson Griffen notched five tackles, two sacks, and a blocked punt touchdown in today's game. He was beating Byron Bell off of the line of scrimmage on about every other snap. Griffen's athleticism and his ability to make plays are both attributes that are irreplaceable on this Vikings defense. Sharrif Floyd provided help in the pass rush and added a sack, until he left in the second half with a knee injury. The Vikings pass rush was able to heckle Cam Newton, causing him to be unable to step into the pocket and make throws on time. When he had time to make the throws, he was extremely accurate and the Vikings were able to limit the amount of times these throws took place. Chad Greenway led the Vikings in tackles (10) and he played his best game of the season as a coverage linebacker. He blanketed Greg Olsen on a crossing route and delayed his ability to catch the pass. Greenway added a pass defensed later in the game and he made the tough tackles in space. Those are the types of things he hasn't been able to do lately. He didn't miss many tackles and I only counted one occasion where he wasn't able to stay in his lane on a running play. This type of performance is deserving of an Arif Hasan fist bump. Anthony Barr left the game with a left knee injury and hasn't been playing like himself lately. He missed some tackles and was out of position before exiting late in the 3rd quarter. No indication was made on how serious his injury is, but Gerald Hodges added a nice pass defensed in his absence. Xavier Rhodes is developing into a premier cornerback for this team and his ability to make the aggressive plays against wide receivers is extremely encouraging. He limited Kelvin Benjamin to 56 yards receiving and held Jordy Nelson to 60 last week. Rhodes is definitely settling into Coach Zimmer's scheme and if he continues to grow, he can become one of the top cornerbacks in the league. His balls skills are improving and he nearly added an interception as he was rolling to the ground near the sidelines. Rhodes' ability to deflect passes and add passes defensed are all tangibles that are starting to develop with coaching in his technique and footwork. In addition, Josh Robinson added an interception, but he was burned on a 37-yard touchdown pass over the top to Philly Brown. Nonetheless, the Vikings secondary allowed just 194 yards through air and just one touchdown. They are playing at a level we simply aren't used to and it will only help this young group going forward. Adam Thielen blocked a punt, recovered the ball, and scooped it up for a touchdown. It was the first Vikings blocked punt touchdown since 1986. That record lasted for just over 12 minutes, until Jasper Brinkley blocked another kick and Everson Griffen scooped it up for a touchdown. The Vikings are the first NFL team since the 1975 Detroit Lions to accumulate two blocked punt touchdowns in the same half. These are the types of contributions the Vikings have been searching for from the special teams group. They finally made an impact and it played a pivotal role in Minnesota being able to jump out to an early lead. The Vikings will wrap up their three-game homestand against the New York Jets at TCF Bank Stadium beginning at noon next Sunday.